How to clear a clogged sink or bathroom bathtub drain with a plunger or by disassembling the plumbing, cleaning it, and reassembling the down pipe and p-trap using Teflon tape. Drains clogged up with hair; what an irritation. Its second only to a toilet problem. Its usually something we put off fixing until one morning the water wont drain at all. Most often the cause is a build up of hair and soap scum. Over the course of time the two slowly conspire to frustrate us. This happens in two areas of a bathroom; in your sink and in the bathtub. So lets look at the best ways of removing hair from a drain. Make no mistake about it; chemical drain cleaners are not your friends. Even though TV commercials will try to convince you otherwise, they are at best temporary solutions that will do more harm than good in the long run. Why? Because theyre harsh. Thats how they work. Products in this category include Draino, Liquid-Plumr, and Roebic Heavy Duty Crystal Drain Cleaner. If you truely want to pour something down your drain, try using biological cleaners that use enzymes or bacteria to gobble through clogs. Citra-Drain and Zep are a couple of the best ones. Youve got to love green cleaning products. Sprinkle a half of a box of baking soda down the drain. Pour vinegar over the baking soda. You should see a foaming action. When the foam subsides, repeat pouring vinegar until all of the baking soda is gone. Wait 10 minutes and flush with hot water. If you have a pedestal sink or its part of the countertop, first use a plunger. 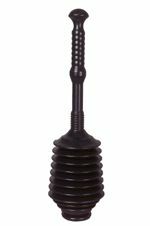 The best type is a half cup plunger. Dont try a plunger on a sink that's mounted below the countertop. The downward force might break it from the countertop. The clogged drain will then be the least of your concerns. Before you use the plunger make these preparations. Be sure that the stopper is locked in the open position. Make sure to seal your sinks overflow opening with a wet rag. This will give you a good tight seal. Remove any debris accessible at the drains opening. Turn on the hot water until your sink is approximately halfway full (if its not already). Begin plunging using slow, repeated strokes. Youll know when you're getting too aggressive; your face will be wet. Still stopped up? The easiest next thing to try is to physically get that stuff to pass out of the pipes. There are a variety of nini-snakes on the market today. I have not tried them but they look like they would perform. What I have used is a long plastic strip with teeth on it. Its called a Zip-It. The good thing is that you can use it without removing the pop-up stopper. Your Drain is Still Clogged? If plunging didnt solve the problem, youll need to back up, regroup, and enter the surgery mode. Get under the sink. Disconnect all your pipes having a bucket handy. At a minimum there should be the drain pipe, the p-trap, and perhaps a section of pipe that connects to a drain stub coming from the wall. 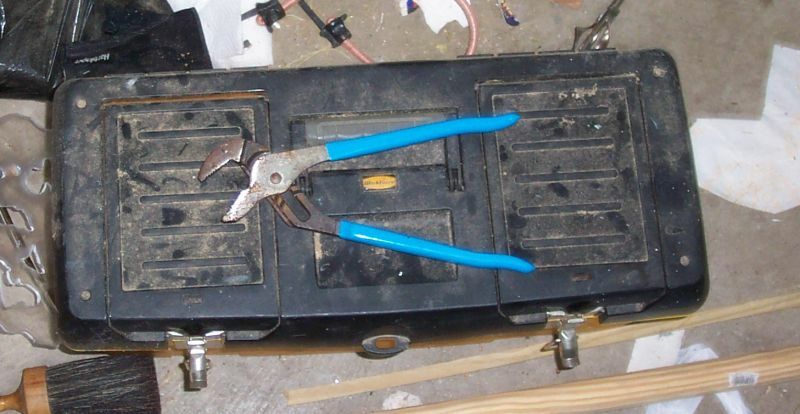 Use your tongue and groove pliers (Channel Lock pliers) to disassemble everything. Channel Lock pliers are on your list of essential handtools for your toolbox. Clean everything with a rag and a brush and then reassemble everything. Use Teflon tape on every threaded surface. Test the system by running hot water for several minutes while you check for leaks. Then tighten the connections if you need to and youre finished. What? Drain Still Stopped Up After All That? At this point you know the clog is further down the line. Its time to resort to a plumbing snake. Theyre simple to use, if a bit messy. Ease it down the drain slowly while turning the snake, either electric or hand-crank. You may have to back up a few inches and go forward again when you find the clog. Youll feel it when you hit it and youll feel it when it breaks free. If you dont feel comfortable doing this job yourself need a Plumber? Find local unbiased reviews on the best plumbers - Try Angie’s List . 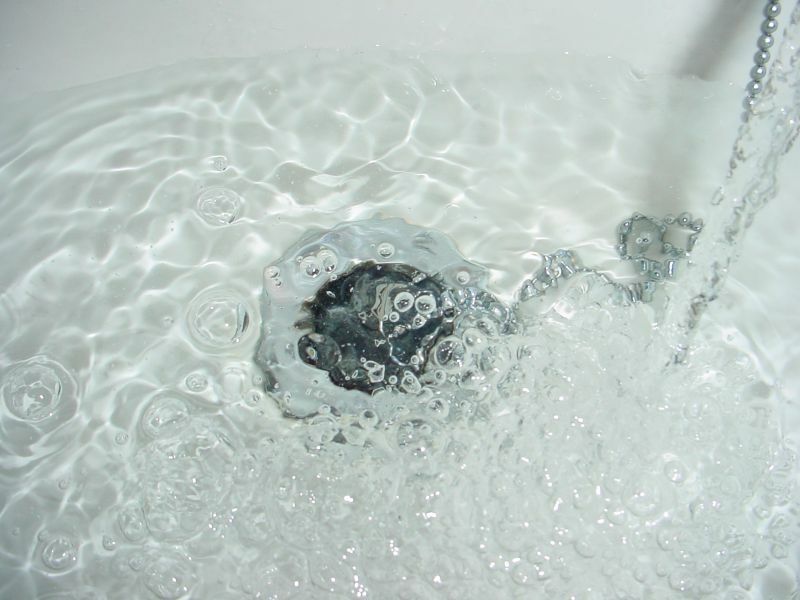 Unclogging a bathtub drain is similar to unclogging the sink. The basic difference is how your hardware is set up. First try plunging. As before, you will need to block your overflow using a wet rag, ensuring that the plunger works effectively. Next take out your drain stopper. It might be a built-in type and this involves rotating it counter clockwise and then pulling straight up. If your type is different, ask the local home improvement store. Now turn on the hot water until theres about three inches of water in the tub. Next begin plunging the plunger until you see the water flowing freely down the drain. Now re-install the stopper.